Looking for stellar ways to add more greens and beets to your diet? This Beet Blueberry Antioxidant Smoothie is jam-packed with superhero nutrition and delicious berry goodness. 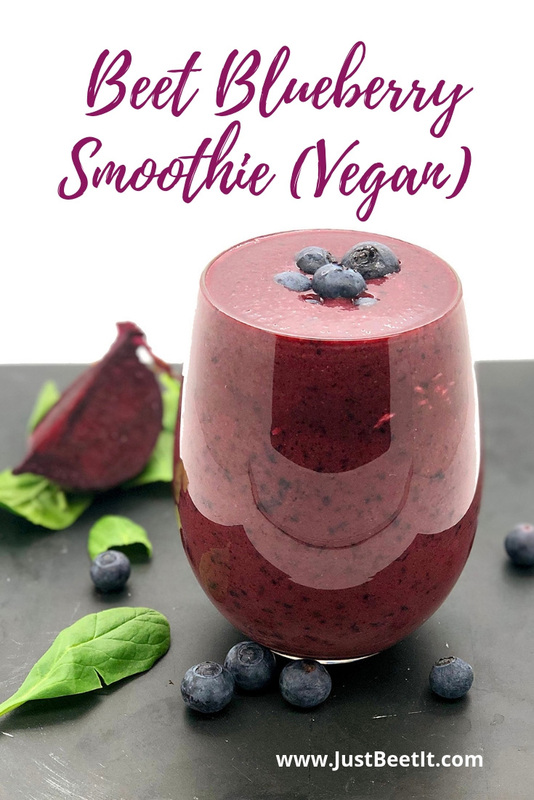 Blueberries pair beautifully with red beets, and the combination of sweet slightly tart berries and earthy sweet red beet is so delightful that your kiddos (and other beet-resistant family members) may even get on board with beets after drinking this smoothie. Well- you can try! Adding strawberries, blackberries, raspberries, or blueberries to your diet is a fabulous way to boost immunity and reduce inflammation in your body. Besides Vitamin C (essential for immune health), blueberries are high in trace minerals and antioxidants to fight free radicals in your body and reduce inflammation. Free radicals are unstable molecules that can damage cells in the body, by “stealing” electrons through oxidation. This oxidative damage means that cells or parts of cells don’t function in a healthy and normal way. The great news is that blueberries and other healthy foods have the antidote! Blueberries contain incredible micronutrients packed with antioxidants to target and eliminate free radicals in our bodies. Guess what? Beets do that too! The combination of beets with blueberries is incredible as both contain powerful antioxidants. The beautiful red color of beets is due to betalain, a pigment found in many plants that aids in reducing inflammation in the body and fighting against free radicals. Beets are antioxidant-rich! They are also marvelous for promoting heart health as well, so this smoothie is filled with heart-healthy, immune-boosting, inflammation reducing nutrients. Wahoo! If you are not a beet enthusiast (YET), blending berries with red beets is quite helpful. Berries, such as blueberries and strawberries help neutralize the beet’s distinctly earthy flavor. When blending raw beets in smoothies (if wanting to disguise the beet’s flavor), use coconut water or almond milk (or a preferred milk) as a base. Coconut water and nut milks create a lovely base for smoothies. Milks (dairy or non-dairy) create a creamier texture for smoothies. Coconut water is thinner and less creamy. This smoothie includes a handful of baby spinach for extra nutrition and fiber; however, baby kale, baby chard or beet greens work fine too. Add your favorite protein powder, and VOILA! This smoothie is filled with antioxidants AND protein. For more tips on eating the extraordinary beet, peruse How to Eat the Beet From Root to Leaf and How to Prepare the Beet: 5 Simple Ways to Cook Beets. Want to enjoy other scrumptious beet berry smoothies? Try Blackberry, Beet and Cacao Smoothie or Beet Strawberry Vanilla Smoothie. What are your favorite recipes using berries? Comment below. Gently wash beetroot. Use organic when possible. Peel beet and cut in quarters. In a high-speed blender, blend raw beet, blueberries, spinach, banana, almond water (or coconut water), and vegan protein powder. Add more water or ice cubes for a preferred thinner or thicker texture. Top with coconut shreds or hemp seeds (optional).